This page is for the original release. For the Definitive Edition, see Dead Island: Definitive Edition. 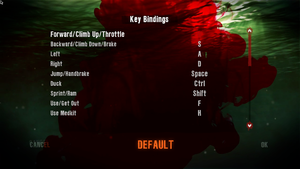 The Dead Island Helper utility can be used to fix many bugs and tweak advanced graphics settings. 9.3 Co-op error message: "The game you have tried to join is no longer available"
9.6 Game crashes with message: "Problem Event: BEX"
OS X only. Cannot play with Steam players. Game of the Year Edition only. Following the release of Dead Island: Definitive Edition, the game has been pulled from most digital distribution platforms. The Game of the Year edition contains all DLC. Contains all DLC. Available on Amazon.com. Utility to apply fixes and tweaks to the game. Not compatible with Dead Island: Definitive Edition. Use Widescreen Fixer or see Field of view (FOV). Enable windowed mode with desktop's resolution. Nvidia users can use Inspector and the flag 0x000010C1 (With AA fix enabled) to use SGSSAA. 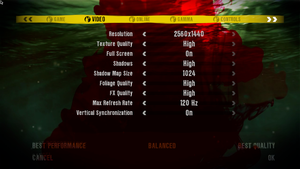 Disabling in-game Vsync caps the frame rate at 60 FPS. See Run the game at screen refresh rate. Find CameraDefaultFOV and change it accordingly. 90-100 works well for 16:9, 85-95 works well for 16:10, 65-75 works well for 4:3 or 5:4 resolutions (lower values may induce motion sickness). XInput and DirectInput, designed for XInput controllers. OS X controller support requires the Tattiebogle OS X driver. 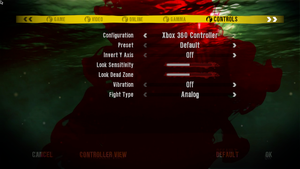 Renders most DirectInput controllers unuseable, use XInput wrapper to bypass. Not available in some menus. If you have installed mods or edited the .xml for characters, all clients need the same mods in order to play. 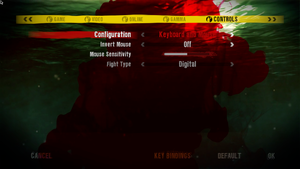 See Helix Mod: Dead Island for better support. You can find various fixes in the FAQ on the Steam Community Discussions page for Dead Island. If you don't want to manually apply some of these tweaks check out tools section at end of the page. Some users are experiencing ridiculously long load times when doing things like loading the menu, game, etc. It can literally take over 5–10 minutes for some people. Oddly enough, this may relate to error logging that is done by the game. Co-op error message: "The game you have tried to join is no longer available"
Download and install Hamachi which allows you to simulate a LAN over the internet. Power Hamachi on, start a new network, and invite your friends to it. 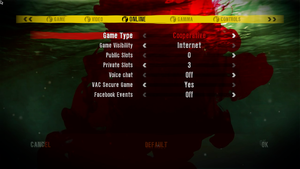 Start a Dead Island game after setting the game to co-operative and LAN in the options menu. Your server will now show up for anyone on your Hamachi network. Right-click at the Dead Island process under details and click Set Affinity. You have to repeat this whenever you start the game. 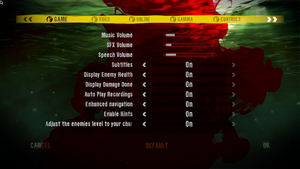 Dead Island has a compatibility problem with 7.1 output devices, this includes Logitech USB headsets (G35, G930) and 7.1 sound devices that use 3.5 mm analog connections. This issue is typically immediately recognizable when reaching the title screen and hearing a loud, frightening, distorted noise; this issue also carries over into the gameplay. 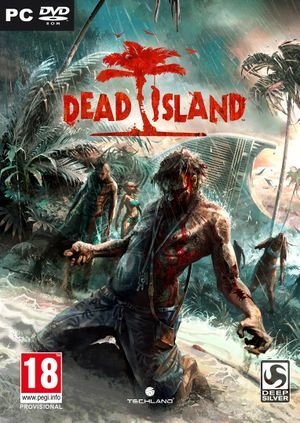 This issue was present in Dead Island: Riptide, but was corrected by Techland. Techland has yet to correct the issue with the first Dead Island game. The definitive solution is to set your device to anything below 7.1 but other options exist that may help. Select 5.1 surround or lower. Remember to reconfigure your 7.1 device to 7.1 output after you are done playing Dead Island. Look for the Audio.scr file and open it with a text editor. This will fix the game's sound partly, because static might still occur however most of the problem is over. If this fix does not work, there is an alternative solution to static and crackling problems below. It is recommended that you backup the Audio.scr file before doing this, though if you don't you can always just delete the file and the game will create a new one. Select all of the file's contents and delete them, making the file empty, and then save the file. Right-click the file, select Properties, check the Read-only box, click Apply, and then click OK.
Game crashes with message: "Problem Event: BEX"
Problem event name: BEX App Name: DeadIslandGame.exe App version: 1.0.0.0 App timestamp: 4f100716 Fault module name: MSVCR90.dll Fault module version: 9.0.30729.6161 Fault module timestamp: 4dace5b9 Exception offset: 00036d36 Exception code: c0000417 Exception data 00000000 OS version: 6.1.7601.2.1.0.768.3 Locale ID: 1033 Additional info 1: 364e Additional info 2:364ecf2f9e26d8075e002643326a0340 Additional info 3: 1f40 Additional info 4: 1f4001d1190a4d768106236129b38e30c. Fullscreen mode only offers the option to use a refresh rate of 100 Hz or less, even if the screen refresh rate is set higher than that. Enable Windows 7 compatibility mode. Change Fullscreen() to Fullscreen(0) (or add it if it doesn't exist). 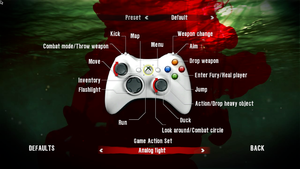 The PC port of Dead Island have aim assist. There is no way to disable this. ↑ 1.0 1.1 File/folder structure within this directory reflects the path(s) listed for Windows and/or Steam game data (use Wine regedit to access Windows registry paths). Games with Steam Cloud support may store data in ~/.steam/steam/userdata/<user-id>/91310/ in addition to or instead of this directory. The app ID (91310) may differ in some cases. Treat backslashes as forward slashes. See the glossary page for details. ""Please note: Multiplayer between the Mac App Store version and the Steam version is not possible."" This page was last edited on 1 April 2019, at 21:40.